When you are lost, you look for direction. Both statements ring true for me lately. I've made it known that I've been struggling for awhile. I also feel that with everything that is happening, I feel that I've hidden myself away under a facade. A facade that is cracking, is not genuine, and needs to be removed. I expressed myself today at church, probably a mistake because the words never match the intent of my heart but I did it anyway. I kept thinking about some lyrics to a hymn, "in the quiet heart is hidden sorrow that the eye can't see". Those words kept repeating over and over in my mind and since I was sitting in the back of the chapel I started looking at those in front of me and wondering, how many of these people are hidden away under their own facades? How many people are struggling but nobody knows? I'm convinced more than a few people in that chapel are struggling privately with something and I wanted them to know they aren't alone. It's okay to struggle! It's ok to let go of the appearance of perfection. I'm tired of pretending that I'm ok. I'm tired of putting on the appearance that all is well. I'm tired of giving the "church answers" because that's what I'm supposed to do. A few weeks ago my little Jet over-heard a conversation Mr. K and I were having and she interrupted and said, "but Mom, your not struggling!" What an injustice I am doing for my girls if I keep pretending everything is ok. How will they ever know what to do when they hit a similar low in life. I don't want to burden them with my problems, I want to shelter them, but I also need to be honest with them too. Miss M already struggles and an interesting thing has happened with her. Recently I gave her permission to not be perfect. I gave her permission to stop pretending that an uncomfortable situation she has been in for a long time was "ok". I gave her permission to find a better place to be in even if those around her didn't understand. It's only been two weeks but letting her know that it was ok and that she could make her own choices in how she handled the situation was all she needed. It empowered her. She just needed to know it was ok to be honest with herself about how she was feeling. She needed to know it was ok to stop pretending. I'm learning from her. She's braver lately. She is slowly putting herself back into the situation but is doing so on her own terms and I can see the peace she has because of it. So what does this all have to do with an Atheist, A Christian, and a Buddha? Well, last week, as you know, I made a 15 hour round-trip journey to say good-bye to a loved one. I can't really speak about the 20 minute, timer controlled, visit yet - it still hurts too much. But I can share with you the experience I had afterward. My brother - the atheist, and I - the Christian, met for lunch and that's where we found Buddha. We had a great conversation, we shared our frustration and sadness about the current family situation. We talked about raising our own kids and being the parents now. And we talked about the sense of purpose, that as we age, we are both trying to fine tune in our lives. I told him how I feel like I've lost my quirk. My spark is gone. How my outer facade doesn't match the inner feelings I have about who I am, like I'm hiding myself. I told him about the note I found that my dad, a dedicated man of faith, wrote that expressed some of his concerns about what would happen after death. I told my brother how that note rocked my faith and made me question my own views. And my atheist brother, without even knowing it, directed me to the answer I've been looking for. I see it as a God-send, he sees it as the result of deep human connection. He shared with me a conversation he had with my dad when he told my dad that he was leaving our faith. My dad asked him if ever felt the church we belong to was true. My brother had said yes but that his opinion, because of doubts, had changed and my dad, this giant figure of religious faith, told him that sometimes he had doubts too. My dad, MY DAD! the man that read his scriptures, served in bishoprics, faithfully did his home teaching, worked in the temple and said prayers regularly, had doubts! How is it that I never knew this? and then my brother continued to tell me what my dad told him. When my dad had doubts instead of dwelling on them, he went back to those times that there were no doubts, to those times that he witnessed God's active hand in his life and as he reviewed those moments, the doubts -the not having all the answers - didn't matter because he was reminded of those things that he did know and that he could not deny. I just needed to hear that. I needed to know that it was ok to struggle with the questions I was having but that I shouldn't let those questions over-rule what I had already had witnessed to me on so many other occasions. As we were leaving my brother opened a newspaper sitting on the table and said we should read our horoscopes. My mom loved reading, and looking for meaning, in her horoscope so the tradition has kind of carried on to us kids. My brother read mine first. 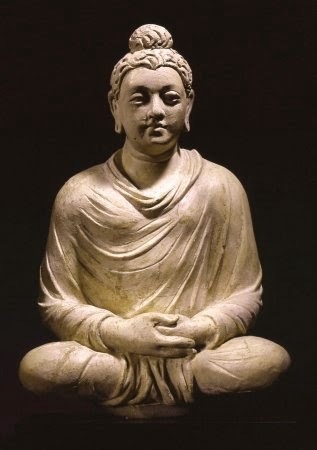 A large plaster Buddha statue was housed at a modest temple in Bangkok, Thailand from 1935 - 1955. No one knew its age or origins. In May of 1955, workers were struggling to move the heavy ten-foot icon to a new building on the temple grounds when it accidentally broke free of the ropes that secured it. As it hit the ground, a chunk of plaster fell off, revealing a sheen of gold beneath. Religious leaders authorized the removal of the remaining plaster surface. Hidden inside was a solid gold Buddha that is today worth $250 million dollars. Research later revealed that the plaster had been applied by 18th century monks to prevent the statue from being looted. I foresee a comparable sequence unfolding in the coming weeks for you, Leo. What will it take to free a valuable resource that's concealed within a cheap veneer? So, there we were, wrapping up our lunch. The Atheist, the Christian and now we have Buddha. Sometimes our answers come in the most unlikeliest ways. When I returned home I sent my brother a text letting him know I'd arrived safely and he responded by saying. "Glad you are safe, good luck chipping away at your golden Buddha!" I'm not perfect. I've always known that but I've pretended to be for far too long. I was too scared to let out the real me, the imperfect me, because of what others would think or for fear that I'd be seen or judged in the wrong way. But in my quiet heart I've kept too many things hidden and it IS time to start chipping away at that facade. It makes people uncomfortable to tell them it's ok to struggle. I did that today at church and noticed how after the service people didn't know how to respond to me. Or maybe it was I didn't know how to act after putting so much out there. Either way, it was lonely but that's ok, much like my daughter, I'd rather be alone and honest about what is happening, than suffering in the group trying to pretend everything's perfect. I tell my young women that I serve with that they are amazing. I tell them all the time that they have divine potential inside of them and you know what, I know that is true. It's true for me too. I will get through this hard time. I will move past the struggles. It will be a slow process but as I work through it honestly I will be slowly chipping away at my golden Buddha, my own divine potential, that I have sadly hidden away for far too long. NOW, moving on.... I've written a lot of deep posts lately, thank you for sticking with me. I have decided to keep these post to a minimum going forward. We still have a funeral coming up, there will still be sadness but unless I feel really inspired to share, the crafting will once again return and be the main focus of this blog. And, one more time, from the bottom of my heart, I thank you all for your support and encouragement. From an Atheist (me) to a Christian (you)..that I have never met, and only know due to your wonderful crafting ability, and your ability to blog about it, while never ever letting on that you are perfect, after I read your first blog, I stayed because just your words made me feel like I didn't need the crafting ability of Martha Stewart, to partake in the fun. Because trust me, my skill level is about one notch above being old enough to plug in the glue gun without supervision. I love that about your blog. Anyways, I hope you find your golden Buddha, and I needed to read this today, although my struggles are not nearly as wrenching as yours, I am struggling nonetheless. Thank you for the message. Another plaster chip just fell. As a Christian, mother to a daughter about to become a teenager and as a crafter I love seeing your posts pop up in my email. I am glad you are finding the gold inside you. Keep chipping away! And don't fret over mixing in the personal posts with the crafts and fun. That mix is why you are on my very short lists of blogs I love and that I learn from and grow from. I wish you could come visit my church, you would have been sore from all the hugs and wet from shared tears of love. I'm sorry you spoke of your struggles and didn't get any support. As I read that, I wanted to reach through the computer and give you a huge hug. I understand what you're dealing with. Maybe not exactly, but I'm struggling, too. And, like you, I feel like I have to keep it all inside. Thank you for sharing this. It's given me the courage to open up and say something. I think my husband and I will have a long talk after our daughter is in bed tonight. Huge hugs to you! Thank you for your courage and honesty. You have an amazing voice which you express so beautifully. Your words have really helped me recently. I continue to be a huge fan of your artistry,however please continue to share your thoughts. One chip at a time. Thank you for sharing your struggle. My husband is walking that same path right now and even though you dont know us it is helping me help him. so thank you. you and your family are in my prayers. I wish that we were still in the basement at Moreis having the conversations we ALL need. Amy, we all love you. I didn't see you after sacrament meeting. I'm not sure where you were second hour, and you're tucked away with the young women 3rd hour. It is good you are coming to this understanding, because it will open up a whole new world for you. There is a culture created by people that is not a part of the gospel of Jesus Christ. It is not exclusive to any one religion either. All have struggles and doubts in every faith. Even women in various settings try to measure up to others and compete and judge. This, however, is not what our Father has intended for us. He loves us in our imperfections and only asks that we have faith in Him and keep trying. Church is meant to be a place where we can all feel loved and accepted, despite our struggles, and where we can strengthen one another. There is perfect truth in our church, but there is no perfect body of believers in any church. It’s a funny thing: the churches with more standards of how we should be in our daily walk with Christ can have members with a tendency to judge one another, and the more a church tells their members sin is okay, the more acceptance there can be. The problem with the former lies with members being too hard on themselves. The second great commandment is to love others as we love ourselves, because we can’t accept others if we cannot accept ourselves. It’s essential for a church to teach that every form of sin is not okay and to teach of the many ways we can show love for others, because it’s only in learning to do more of what Christ would do that we can have more inner peace and joy. This is truth, and any church that teaches that Christ saves us “in” our sins is false. Christ saves us “from” our sins, as we repent and grow and keep trying, and God wants us to know this so we will work on improving our characters and our relationship so we can have greater fulfillment and joy. Amy, you are already a good person. You are growing, and that’s all God wants from us. God looks at our heart, not at all the outward things we are doing better or worse than others. Life is about learning how to love and finding ways to express that love, be it with our church assignments, community outreach, etc., and you are doing that! There will always be many “shoulds” in our heads, but as we put the Lord first and prioritize other things, those demands in our head get balanced out and some get eliminated, and we end up feeling at peace with what we are doing and no longer concerned what others are doing. I am not perfect at any of this, but I have found peace in this. You will be blessed for your authenticity and be a blessing to others as well, and you will find that you are even more loved than you knew. Thank you for posting this. I have been going through a rough patch lately and just yesterday I told my husband that I was tired of pretending that everything is ok. Keeping up the facade has been exhausting and it really helps to hear that I am not the only one. I have been trying out figure out how to fix it and you are right. I need to give myself permission to fail. I don't know if I can, but I will try. I really appreciate how you have the courage to post about real, important things. It seems like most of the blogs are becoming more about the same fluff and perfection, and it is getting tedious. This has been a breath of fresh air. Good luck to you on your journey. I wish you were in my ward! I've been reading your blog for awhile but have never commented until now. I hope you will find that members of your congregation will respond positively to your attempts to drop the facade. I know when I began sharing my struggles with depression and adoption that women I didn't really know began sharing their struggles too and that made us feel closer. We all need the reminder that we covenanted to "bear one another's burdens" and that we actually have burdens we are bearing! I think too, that when we are young we think everything is peachy and it is only as we get older and are raising teens that we begin to have enough experience to see that life is so much more out of our control than we used to think. That's been my experience, anyway. Thanks for sharing your struggles here - it is good to know that I'm not alone! Please keep sharing ...you are helping all of us who are struggling. Thank you for your post. I really needed to read this today because I am going through some struggles with my faith too. I wish you good wishes on your journey and to keep chipping away at your Buddha...I never looked at it in that way but after reading your blog post, I will look at my journey in a different way. Hola from México Amy. I had to write to you to say THANK YOU! It would take a lot of words to tell you in detail how much your post "An Atheist, A Christian, and Buddha" has helped me today. I stopped by your blog early this morning looking for a tuto on those soo cute inspirational bracelets you made and then I read the header of that post and immediately caught my attention since my dad was an atheist, I guess I'm a Christian and I like Buddha a LOT! I thought: this must be fun to read, so I did. OMG . . . . IT HIT ME LIKE A THUNDER!! It was as if you were talking to me (or the other was around). It was a really emotional moment for me and again, I thank you for that. After reading it, I could only think it was a gift from God to me. I stayed in bed for a while trying to understand what had just happened and then I got up and did something rather important that I had been postponing for a long time, out of fear. It makes me sad to read that out of your immediate family, you feel alone because I'm sure there's a lot of people like me that are being touched by your words and your emotions and feel the same love for you that I feel right now. How wonderful it would be if we could all hug you tight!! The great Colombian writer Gabriel García Marquez once said "Life is not what we lived but what we remember . . and how we remember it to be able to tell others so it has some meaning to them." The way you tell your story has definitely meaning to me and I'm certain, to many others. I live in the south of México and although there are a lot of very sad things happening in my country now, here in Yucatán life is, as always, very nice and safe. If you ever think of coming here, I'll be more than happy to be your host. I mean it!! It's lovely here - you would like it.